This monthly publication is sent to all student and certified MGVs (the link to the Google doc is emailed). It provides direct communication from the MG Program Office, including an Expert’s Tip, information on a seasonal topic, something about a local MG project, exclusive opportunities for certified MGVs (such as Level 2 training), and a prize for one Lucky MGV. Only Certified MGVs are eligible for an official Wisconsin MGV name badge. Once all the requirements for certification have been completed, a name badge will be ordered (for those taking training after 2014). Replacement badges can be ordered through the local county office. 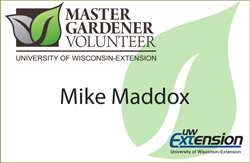 The name badge should be worn whenever the individual is representing UW-Extension as a MGV when working on approved projects. Name badges should NOT be worn during other non-MG activities, such as (but not limited to) political campaigning, drinking at the bar, or when getting paid for work. Information on ordering name badges. MGVs that complete the requirements for the General MG training program are entitled to receive a certificate indicating their completion of the program. Certificates are not automatically sent for a variety of reasons (some groups do not use the standard certificates; some groups want to present certificates to everyone at the same time at a meeting or awards presentation; in some areas people are given their certificate whenever they complete their hours; etc.). Certificates must be requested by the county – they are NOT sent automatically. These certificates can be requested at the completion of all of the requirements of the online training. Level 3 training is only open to certified MGVs, and is only announced through the Volunteer Vibe. Other online trainings, regional workshops, or special activities are also announced only through the Volunteer Vibe. 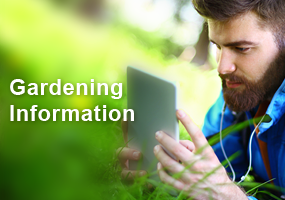 The MG Program Office offers selected garden or horticultural educational tours to various destinations. These tours are open to everyone, not just MGVs. The primary objectives of these study tours are to provide participants with the opportunity to experience horticulture and agriculture production systems in different areas, and gain a new perspective on how other areas or countries and cultures face the issues of a global society. For more info go to the Educational Travel Study Page. 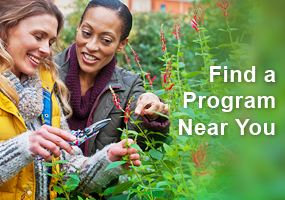 Awards are given to Master Gardener Volunteers who have accumulated 150, 250, 500, 750, 1000, 2500, 5000, 7500 and 10,000 hours of volunteer service. Awards are sent to the local UW-Extension office for distribution locally. The names of award winners are determined from the WIMGA cumulative volunteer records database. 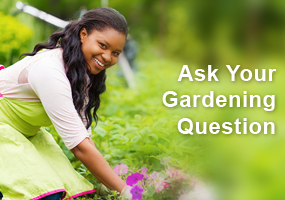 Local associations may determine their own system for rewarding their Master Gardeners Volunteers. Some associations hold a recognition banquet or a pot-luck dinner at which they issue awards. Assorted MGV paraphernalia is available periodically (such as bags, vests, etc.). Other stuff, such as hats or T-shirts, may be available locally.